Hersh Martin serves as a good example of the type of players the Yankees employed during the WWII years, when so many of the guys who constituted Major League Baseball’s regular line-ups were called to service in the military. Martin was New York’s starting left fielder in 1944 and ’45. A native of Birmingham, Alabama, he had originally been signed by the Cardinal organization in 1932, at the age of 22. 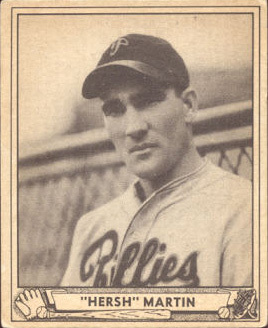 He played the next the next five years in the St Louis farm system and then made his big league debut with the Philadelphia Phillies in 1937. The Philly team he joined was not very good and the switch-hitting Martin became their regular center-fielder. He led that team in runs scored with 102 and hit a solid .283 in his rookie season. He then averaged .298 in 1938 and made the NL All Star team. In June of 1940, the Phillies sold Martin to the New York Giants and he was sent back to the minors, where he spent the next four years. The Yankees then purchased his contract in June of 1944 and manager Joe McCarthy immediately inserted him into the line-up as New York’s starting left fielder. He was 34-years-old by then. He hit .302 during the second half of that season and then followed that up by hitting .268 in 1945. Though he was a big guy, at six feet two inches tall and weighing close to two hundred pounds, Martin did not have much power. He also was not noted for his speed. The truth of the matter is that he probably would not have got the opportunity to start or maybe even sub for the New York Yankees under normal circumstances. But WWII was not a normal circumstance, and career minor leaguers like Martin, who had some Major League experience on their resumes, did an admirable job keeping our national pastime functioning at a time when our armed forces and those serving the war effort at home, desperately needed something to cheer about. Martin returned to minor league ball after the 1945 season and continued playing regularly at that level until 1953. When he finally hung up his spikes he had 2,299 career base hits as a minor leaguer. He then got into scouting and later worked seventeen years in that capacity for the Mets. He passed away in 1980 at the age of 71. He shares his birthday with this former Cy Young Award winner, this author of a Yankee no-hitter, this oft-injured former Yankee and this teammate of Martin’s on the WWII era Bronx Bombers. This hard-throwing right-hander nicknamed Bullet-Bob, made his big league debut with the St Louis Browns in 1951, but he was supposed to have made that debut as a Yankee. 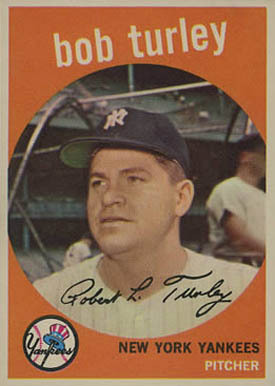 Back in 1948, when Turley was graduating from high school in East St Louis, Illinois, a Yankee scout was sent to sign the young pitcher but made a mistake and instead signed Turley’s two-year-older uncle named Ralph Turley. The Browns took advantage of New York’s carelessness and snatched up the fire-balling nephew. By 1954, the Browns had relocated to Baltimore and become the Orioles and Turley had evolved into a key member of that team’s starting rotation. He went 14-15 for a terrible O’s squad that finished that season with just 50 victories. Turley also led the AL that same year with 185 strikeouts. His problem was control. He had basically one pitch back then, a blazing fastball that he could only throw for strikes about fifty percent of the time. As a result, he also led the AL with 181 walks during the ’54 season, which helps explain why Baltimore was willing to include him in the record 17-player transaction they made with the Yankees in November of 1954. Turley had a decent first year in pinstripes, putting together a 17-13 record for Casey Stengel’s 1955 AL Pennant winners, but the wildness continued. He again led the AL in bases on balls with 171 and then got hammered in his only start against Brooklyn in that year’s World Series. It was the Yankees’ legendary pitching coach, Jim Turner, who got Turley to begin working on a no-wind-up delivery with the hope that less motion would result in more control and the results proved Turner right. His command of the strike zone improved and his bases on balls per nine innings went from a high of 7.0 in 1956 to just 4.3 the following year. In 1958, Turley put everything together and went 21-7 for the Yankees with a 2.97 ERA and 6 shutouts. He won the Cy Young Award and finished second to Boston’s Jackie Jensen in that year’s AL MVP Award voting. He then went on to win the 1958 World Series MVP Award even though he was hammered and lost his first start against the Braves in Game 2 of that Fall Classic. He came back in Game 5 to pitch a five-hit shutout and then relieved Ryne Duren in the bottom of the tenth inning in Game 6 to get the last out and his first World Series save. The gambling Stengel called on Turley yet again to relieve his old Baltimore pitching mate, Don Larsen in the third inning of Game 7. Bullet Bob pitched the final six innings to earn his second win of the Series and clinch the World Championship for New York. Turley was one of baseball’s all-time best sign stealers. He is credited with helping Mickey Mantle hit several of his home runs by whistle-signalling what pitch was coming for the legendary Yankee slugger. After Turley retired, he began selling stocks and securities and became a millionaire. Oh and by the way, Bob’s Uncle Ralph ended up playing two seasons in the Yankee organization but never made it past D league ball. Bob Turley shares his September 19th birthday with this Yankee first baseman named Nick, this other Yankee first baseman named Nick, this WWII era left-fielder and this former Yankee pitcher. The best Yankee players from just about any era in the history of the franchise are generally accorded all the trappings and honors that go with that designation. These guys usually receive serious Hall of Fame consideration if not outright induction. Many are honored with plaques in Yankee Stadium’s Monument Park and you still see their names and uniform numbers on the backs of tribute-paying fans who attend Yankee games. At the very least, their names are still mentioned in polls that ask who the top five all-time Yankees are at each position. So I ask why have most Yankee fans never heard of Nick Etten? 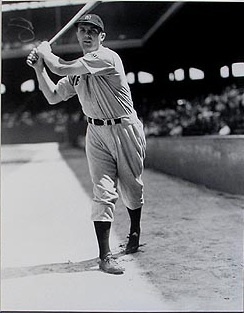 Etten was the best and most celebrated player on three consecutive Yankee teams. He captured an AL Home Run crown and an AL RBI title as well. In fact, during his peak three seasons with New York, he drove in more runs than any other player in the American League. He also won a World Series ring in pinstripes. So I ask again, why do so few Yankee fans even know who Nick Etten is? In any event, Etten did exactly what the Yankees needed him to do, offensively at least, by driving in 309 runs during the next three seasons. Defensively, it was an entirely different story. I’ve read that Etten was the worst defensive first baseman in Yankee history. He refused to move to his right on any ground ball hit that way, which turned the hole between first and second in the Yankee’s wartime infield into a canyon. When he did manage to get his glove on the baseball, Etten had a tough time holding it and throwing it. He made 50 errors during his three seasons as the Yankee’s first baseman. For comparison’s sake, Mark Teixeira has committed a total of just 11 errors during his three seasons as Yankee first baseman and Jason Giambi, who was the poorest defensive first baseman I ever saw play for New York, committed just 36 miscues during his eight seasons with the team. Etten’s moment in the Bronx sun ended pretty quickly when the drafted and enlisted Yankees returned from military service. He continued to start at first for most of the 1946 season but his average and run production numbers tumbled. In April of 1947, the Yankees sold him back to the Phillies and he was out of the big leagues for good before the end of the 1947 season. Etten shares his September 19th birthday with this other former Yankee first baseman, this former Yankee pitcher, this 1958 Cy Young Award winner. and his WWII era teammate of Etten’s. 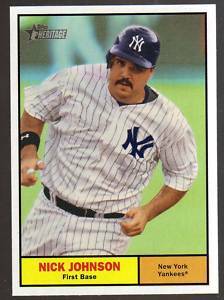 Nobody expected Nick Johnson to be a huge star in the big leagues but when he first came up with New York in August of 2001, the Yankee brass made it sound as if he had a good enough bat to force their poor-fielding first baseman, Jason Giambi to the full-time DH role. He turned out to be an OK fielder with a good batting eye but he definitely did not hit well enough during his first tour of duty in pinstripes to deserve the full-time first-baseman’s job. He was shipped to Montreal in 2004 in the deal that made Javier Vazquez a Yankee for the first time. Since then the injury bug has hit Johnson hard. He was having his best big league season in Washington, in 2006, smacking 23 home runs and averaging a career high .290, when in a late season game he broke a leg when he collided with current Yankee teammate, Austin Kearns. That injury forced Nick to miss the entire 2007 season. Washington traded him to the Marlins during the 2009 season and then Brian Cashman played a hunch and signed Johnson to replace Hideki Matsui as Yankee DH in an effort to save salary. It turned out to be a bad decision for the Yankee GM. The Sacramento native was off to a horrible start last year before an injury placed him on the DL for the remainder of the 2010 season. Johnson was born on September 19, 1978. He shares a birthday with former Yankee starting pitcher, Jim Abbott, former Yankee first baseman, Nick Etten, this WWII era left fielder and the 1958 Cy Young Award winner. 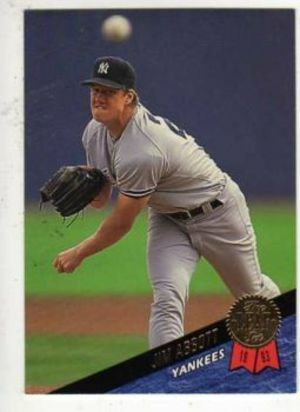 The memory of watching Jim Abbott pitch still leaves me in awe. Born with no right hand, he defied incredible odds and became a front-line starting pitcher in the Major Leagues. He began his big league career as an Angel and in 1991, he finished third in the AL Cy Young Award voting when he put together an 18-11 record with a 2.89 ERA. I still believe that year’s award should have gone to Abbott instead of Roger Clemens and consider the Angel lefthander’s 1991 season one of the most significant accomplishments in baseball history. The bad side was that Abbott pitched 246 innings to achieve those numbers and I believe the resulting wear and tear on his arm hurt the balance of his career. The 1992 Yankees had experienced some horrible starting pitching. When a guy like Melido Perez is the ace of your staff, you know you need to acquire some arms. So when Abbott slumped to 7-15 for the Angels in ’92, he became available and the Yanks gave up a very good prospect named J.T Snow, to get him. New York had also signed free agent Jimmy Key giving them what they hoped would be two big winners for the front of their 1993 rotation. Key had a terrific year, going 18-6. Abbott, on the other hand, struggled, going 11-14 and seeing his ERA increase by a run and a half over the previous season. But he made the deal worth doing with just one incredible performance on September 4 of the 1993 season, when he threw a no-hitter against the Cleveland Indians. Abbott’s Yankee career ended in 1994, when he went 9-8 during the strike-shortened season. He then became a free agent and signed with the White Sox. The low point of his career was 1996, when he returned to the Angels and suffered through a disastrous 2-18 season. He retired in 1999 after being released by the Brewers. His career record was 87-108 but his inspirational impact on America in general and the physically challenged among us in particular, was priceless. Abbott was born in Flint, MI. He shares his September 19th birthday with former Yankee first basemen Nick Johnson and Nick Etten, this WWII era first baseman and the 1958 Cy Young Award winner.